Window shutters provide a stylish, contemporary and timeless window dressing solution. All of our shutters are custom built to the millimetre. They’re measured to fit perfectly, whatever the shape of the window. Whether your window is small and rectangular or something more unusual like a hexagon or an octagon, unlike curtains or blinds, window shutters can be tailored to fit exactly with the size and shape of your window. They provide an altogether more aesthetically pleasing look. Window shutters are incredibly durable and long lasting, due to the fact that they are made of high quality materials that are fixed in place which are less likely to break or to suffer from wear and tear. They last longer than blinds and are easier to clean. Plus they are available in a huge range of styles, materials and finishes, designed to perfectly suit any room in the house. Window shutters are incredibly versatile. They provide varying levels of privacy and light that curtains and blinds simply cannot offer. The style you choose determines the level of privacy. With flexibility unrivalled by other window dressings, depending on the louver you choose, you can have full privacy while still allowing for a generous amount of light to be let into the room, as well as views out. Because window shutters are custom built to fit the window, there are less gaps for cold air to get into the room. They can help maintain a desired room temperature and significantly improve energy performance and reduce heating bills. 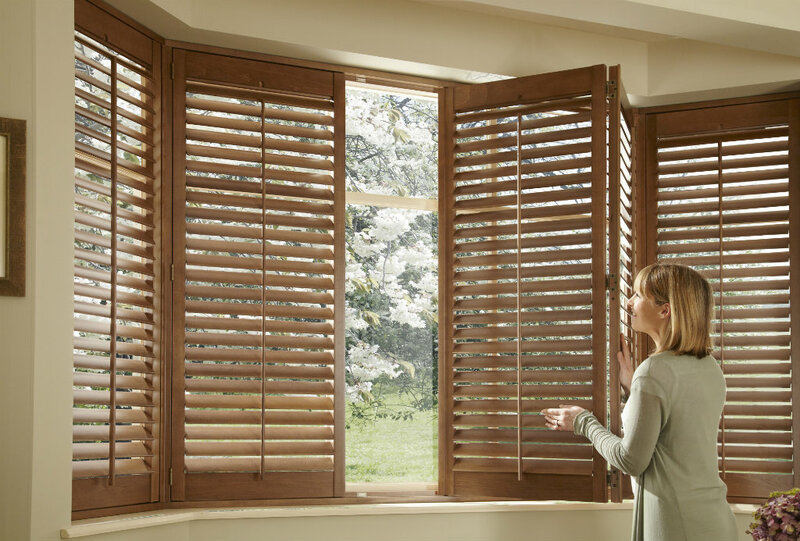 Depending on the material you choose, window shutters can help reduce the amount of external noise heard within the room. Unlike curtains, which typically remain open during daylight hours, window shutters can be set to be partially open which allows the required light into the room whilst simultaneously reducing the impact of full sun on fabrics, furniture and carpets. Interior shutters can help with security as they make it difficult, or sometimes impossible, for people to see into your home and they can act as a deterrent to intruders as they are another barrier to entry. In addition they can deter other intruders such as bees, wasps and flies! Window shutters are not fussy. Unlike curtains, they suit rooms looking to achieve a minimalist style and they can make a room feel bigger. If you would like a guide price for shutters, send us your window dimensions and we will send you an indication based on our entry level Seattle MDF product. Should you then wish to proceed with a free home design visit, we will get this booked in for you as soon as possible. On a breezy day, with your window open, window shutters aren’t going to move and rattle like a blind. We offer a fully waterproof product which is ideal for bathrooms or humid areas. We also have experience in installing shutters to conservatories which will help make them a room that you can use all year round. Window shutters may add to the value of a home and improve the look of your house from both the inside and out. Shutters are perfect for children’s rooms and nurseries. Unlike blinds, there are no cords for a child to play with. Shutters also help to control the light, ensuring a good night’s sleep for all.